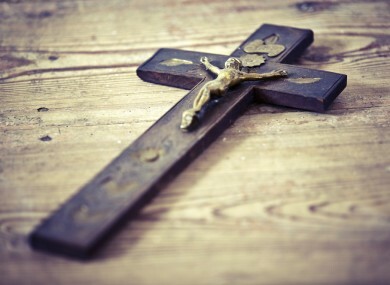 The idea for the crucifix was proposed Fianna Fáil Councillor John Joe Culloty who put down the motion at an April meeting. A CRUCIFIX ERECTED IN the Kerry County Council meeting chambers in Tralee has caused some controversy with questions being raised as to whether it is in breach of equality legislation. Concerns were apparently raised at the time expressed at the time, but six out of nine councillors who were present for the vote voted in favour of the move. Speaking to TheJournal.ie, Cllr John Joe Culloty said he wondered what “all the fuss was about” saying that the motion was put down and ultimately it was passed. “That should really be the end of it,” he said. He said everyone on the day had a chance to give their thoughts on it, but the motion was passed. He said that he was aware that there were crucifixes in other council chambers around the country, adding that no such fuss has been made about them. He claimed that putting a crucifix in the chamber was “checked out” and that it was found not to controvene any law. “Information was given to the secretary of Kerry County Council. When the motion was passed, it was all checked out with the law and no infringements were found. It wouldn’t have gone up if there had been,” he said. “I am a Christian, I don’t have a choice. I do what I think it right,” he said. Speaking on Newstalk Breakfast this morning, Facilities Manager with Kerry County Council John Purcell said that the motion was resolution was adopted by the council and “has now been put in place”. Religion has long had a place in local politics. Most local council meetings around the country begin with all councillors standing while the Lord’s Prayer is said. It is also common for a list of the recently deceased to be read out at most council meetings, where councillors stand for a minute’s silence or prayer in remembrance of those that have passed. In 2012, the proposal to get rid of prayers at the start of Cork City Council meetings caused a row between councillors, when an atheist councillor put down a motion which called for the deletion of a rule governing the order of council business which states that the start of the meetings should begin with the recitation of an opening prayer. And it is not just in Ireland that this debate rages. In the US, the Supreme Court upheld the right to pray at government meetings, in a divided decision which said the practice did not violate religious freedoms. In light of today’s debate, what do you think? Should prayer and religious paraphernalia be removed from council meetings? Email “Crucifix erected in Kerry Council raises questions about equality law”. Feedback on “Crucifix erected in Kerry Council raises questions about equality law”.